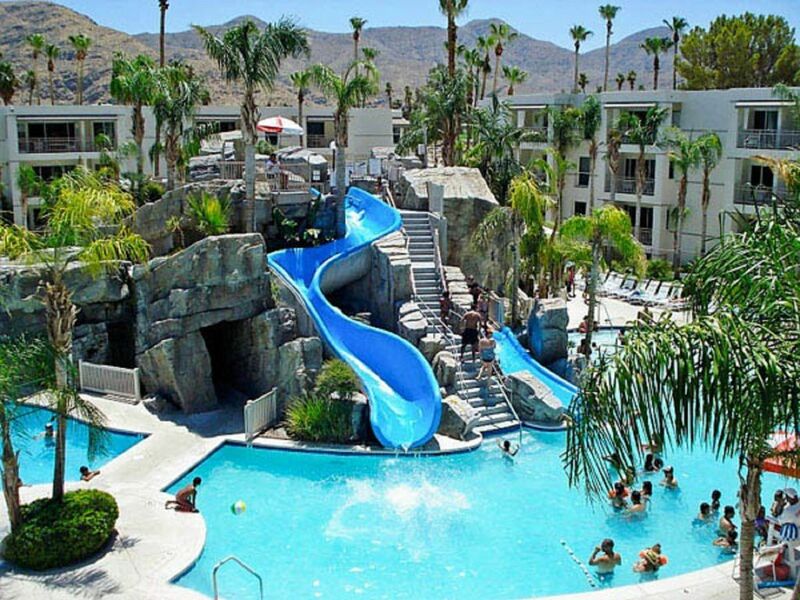 *PALM Canyon RESORT- JR, 1bdrm. 2-bdrms, FANTASTIC pools-* Email for dates! NO TAX or RESORT FEES! can do multiple WEEKS and booking 12 months in advance !!! Choose among spacious, fully-furnished villas offering private bedrooms, well-equipped kitchens, living/dining areas and all the modern comforts of home. Discover serenity while soaking up the warmth and listening to the cascading waterfalls surrounding the 1.5-acre swimming pool and sun deck. Explore lush grottos, rest in the in-cave whirlpool spa, or share the delightful water slides for both adults and children. Pool and mountain view rooms! GREAT location with GREAT ammenties ! Deserts Nearby Golfing!!! On site Tennis, Large heated Pools, Beautiful Views! Nearby hiking and biking. Palm Springs FOLLIES! a must see! Enjoy the Casino's-- The NEW Spa Casino, MORANGO, Aqua Caliente, Trump 29, Casinos here are BEAUTIFUL, Vegas style, buffet, niteclubs...... Downtown Shopping, The Outlet shopping mall, Palm Springs Air Museum Movie theaters, The Tram, Desert hot springs, The living desert, Desert Museum, Indian Canyon Reservation, El Paseo in Palm Desert, Joshua Tree Naional Monument, Annenberg Theater, all very close Fine dining, everything you would want, lots of outdoor dining in downtown Palm Springs, with live bands at many restaurants Or make it a day! AT; The Beach, Disneyland, Knottsberry Farm, The Wax Musumn or San Diego, Idyllwild, The Outlet Mall- Maps available Only a few hours from the condo . The Visitors Center is just across the street..... Have a great time. We had a perfect vacation in your condo. Clean , quiet, and relaxing. All amenities that anyone could ask for. Loved the swimming pools and hot tubs. Beautiful decor with the ocean theme. The location works well with going into town. Nice patio to sit outside with a glass of wine. Comfy chairs. Cannot think of what more a person could want or need. All we could ask for. Even better than expected. I stayed for a month, and it was a great stay. Rhonda checked in on me a multiple times during the stay to make sure everything was going well. I definitely recommend staying here if you are planning a trip to Palm Springs. Beautiful, Had everything needed, We Loved it all. Cozy and Comfy! Convenient to lots of stuff! Have stayed here for a month or two for the past four years. I have always felt very safe here. Golf courses, trails, shopping are close by. The condo itself is very easy to keep neat and tidy. Plan to stay here again. We have been returning to the same place for nine years in a row and look forward to at least another nine years. The development offers everything we could ask for and the unit is very attractive and well kept. The pool is just a few steps away or if you like to walk try the road up to the tramway. We can highly recommend this to anyone who wants a relaxing and enjoyable time in Palm Springs and of course, our enjoyable hosts, Ken and Rhonda, makes the stay worry free. I required an extended stay rental for 6 months in Palm Springs for independent contractor work. The rental is 5 minutes from Downtown Palm Springs, across the street from the Palm Springs visitors center, and just 4 miles from the Palm Springs San Jacinto National Monument Tram. The rental allows easy access to Interstate 10 via hwy 111, Indian Canyon Dr., and Vista Chino, which helped me get around quickly. You can park just out front of the condo to bring your groceries and luggage in super easy. There was always parking available within 50ft of the condo door. The rental had all I needed including quick and strong stream hot shower and a very nice entertainment center. The apt. cools quickly and stays cool even during the Palm Springs summer due to its ground floor location and excellent insulation. A large pool and hot-tub are just around the corner and refreshing even during the summer. The laundry room is a short walk and in the same building on the ground floor. The washers and dryers are industrial allowing one to wash two full loads of clothes at the same time if needed. I would recommend this facility highly!